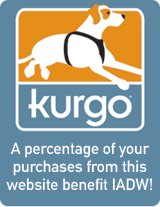 Once again this year, Kurgo is offering International Assistance Dog Week supporters a 30% off coupon code they can use to shop at www.kurgo.com. By using the coupon code, Z73QG2BCP, you’ll not only get a great discount, you’ll help support IADW. A portion of the proceeds from purchases made with the special IADW coupon code will be donated to International Assistance Dog Week. Here's the fine print on the deal: Terms & Conditions: Expires 8/31/14. Only one coupon per customer. Discount can only be applied to product. Does not apply to taxes or shipping. Not valid for past orders.